On the 8th of October, 32-year-old Govind met with a road accident on the streets of Mumbai. He was immediately rushed to Apollo hospital with severe head injuries. He has been in the hospital for a week now and is still in a very critical condition. 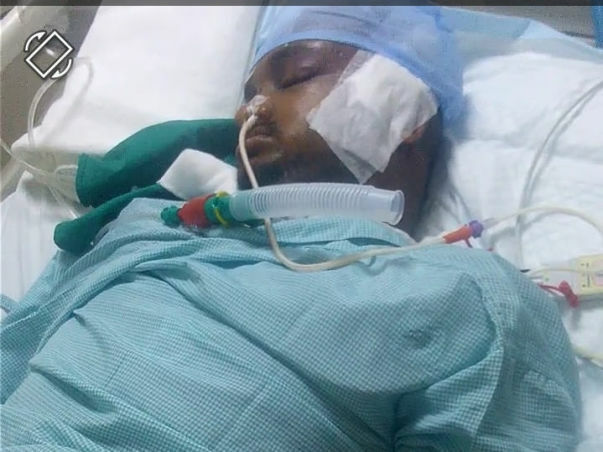 He has been unconscious since he was admitted and is still in the ICU. On the 9th of October, he underwent head surgery but still continues to be in a critical condition on ventilator support. 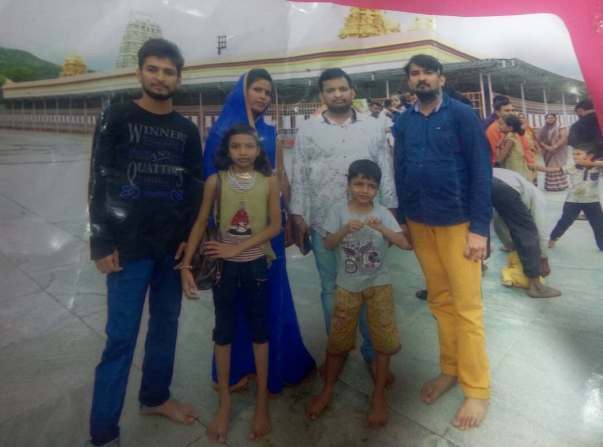 Govind is a family man, with a wife and two children of 10 and 5 years. Since his accident, his wife Kamala's world has been turned upside down. Not only does she need to worry about saving her husband, but about her two young children and now an added pressure of paying the hospital bill. Govind runs a small shoe store making around Rs. 4000 a month by mending and making shoes after paying the rent for the shop. His family do not have the funds to pay for his treatment and supportive care. 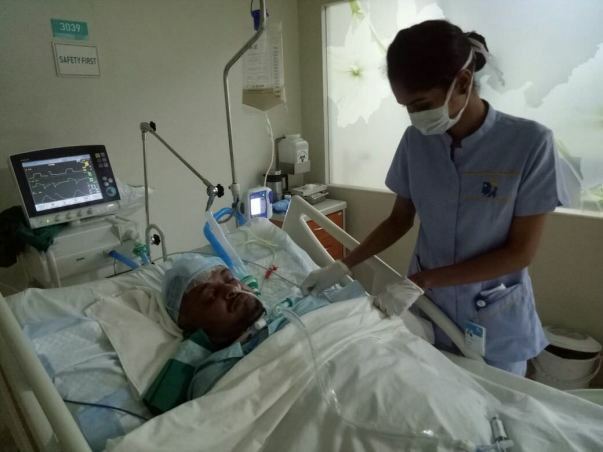 His wife even considered moving to him to a more affordable hospital but with Govind in such a critical state, she was advised not to. "If we cannot come up with money to pay our bill, we may not be able to continue the treatment. He is my husband. He is a father to our children. He is just 32! He has a long life ahead of him. We just need a chance for him to fight through and make it. Govind is lying on that bed unable to even breathe for himself. He has been there for us through everything. We want to be there for him and not let him down now." Kamala is torn between saving her husband and paying the hospital bills. She needs our help to raise funds for her husband's treatment who requires it urgently. "We never thought this day would come. Now, we are pleading the world for help. Please save my husband!" Your contribution can help save Govind's life. We have some unfortunate news to share. Govind passed away on December 29th. All of us are devastated. He fought very hard and was on the road to recovery, however, succumbed to complications and in spite of the doctors best effort could not make it. The funds have been utilized for his medical expenses so far. Please do pray that his soul finds peace. I thank you for all the love and support you have shown my brother. Here is an update on Govind. Govind has been shifted to the Government hospital in Jodhpur due to the medical expenses. He has been treated for the trouble he had while breathing due to fluid accumulation. He is running a slight fever due to his head injury. He has been shifted back to the ICU due to slight variations in his health condition. 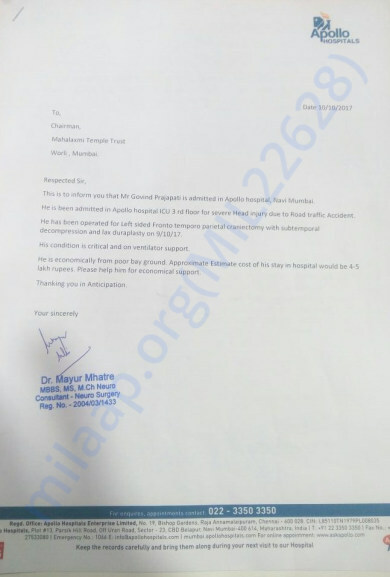 The doctors have advised taking CT scan, blood test, and X-ray from Delhi for further treatment. Thank you for the support and love. Please keep him in your prayers. Thank you for the support you have shown Govind so far. He is still in the ICU under observation. All his vitals have stabilized but his fever is not reducing. The swelling around his brain is also reducing. There is an improvement in his health and but is a little slow. He is able to move his hand a little and is able to change his facial expression mildly. He tries to open his eyes but is not able to. The doctors suggest that if his health improves a little further and his fever reduces, he can be shifted to the ward. Thank you all once again for all the support you have shown my brother. 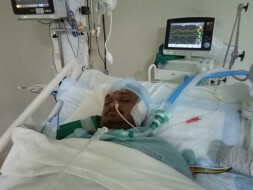 Please do pray for his speedy recovery.